Description: NS 144 is just North of Marion on the Marion Branch near MP-74. Description: Closer View of 144 at MP-74 on the NS Marion Branch just north of Marion. Title: NS Meet at CP 23rd St. Description: AGS 333 meets NS 734 at CP 23rd St. Description: After working Moraine, NS 2594 pulls away from downtown Dayton, OH. on a warm Monday afternoon. Description: Eastbound at Findlay St., shot at 70mm. Description: A NS Auto Rack Train heads south across the CSX Indy Line diamond bound for Columbus and points south. 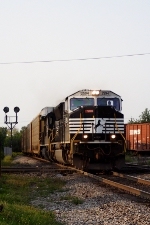 Description: NS 146 roars into Blair yard. Description: NS 123 heads south on the New Castle District at MP 113 south of Muncie. Description: Southbound NS 123 rolls toward Cincinnati, Ohio and points south on the New Castle District just south of Muncie. 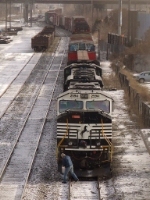 Description: NS 31T/CP 931 sits on the #4 Yard Track as a crewmember prepares to board on a bitterly cold morning. Description: 3 trains in one shot. 223 passes 375 and meets 112. Description: 213 running right behind the 38G at 1:30PM. Description: NS-213 preparing to "Diverge Clear" unto track-1 behind me. Description: 55A with NS 2594 now in the lead backs onto the marion Branch. Description: 55A, grain train just past 8th Street crossing. Description: 55A approaches the 4th Street crossing.